Longbikes has a well-deserved reputation for beautifully built, rugged USS recumbent bikes. Longbikes recumbents are well built, they are so sure of their solo recumbents they guaranteed their frames for riders up to 300 lb. The fittings & hardware made by Longbikes are high quality. Their machining detail is nice. An example of this is the seat struts. They are machined out of solid aluminum rods making them a bit heavier that other struts. 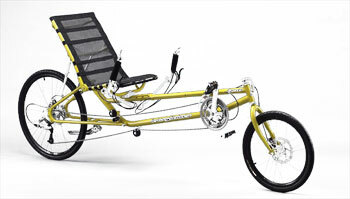 All Longbikes recumbents are available primarily with Under Seat Steering (USS.) Their USS handlebars are adjustable and the bar ends angle can even adjust in and out to your preference. The Longbikes USS hand position is good for most riders. Most riders find the Longbikes (and Linear) hand position and steering geometry much better than on the old Vision USS recumbents. The Longbikes full mesh seats are very breathable and shed water quickly if left out in the rain. Full mesh seats are OK but they are not my favorite. Larger riders tend to like full mesh seats better than I do. Skinny guys like me (6’3, 170 lb) have bony butts and tend to prefer foam-padded seats. Longbikes adjustable angle – folding seat design allows you to adjust the angle between the seat base and back to fine tune your comfort. It also folds for transport. I don’t think the Longbikes seat comfort is up to the very high standard of the rest of the bike, but I’m skinny and I prefer a padded seat base lik on the Linear Recumbents. Larger riders often find the mesh seats comfortable. The finish on Longbikes is excellent. Smooth welds, unique, rugged and replaceable dropouts, shiny glossy powder-coat paint and finely detailed and finished machined parts combine to give an overall appearance that is nice. You get a lot of meticulous durability for the price with either the Longbikes Slipstream or Eliminator. If you like the relaxing LWB ride and USS position of the Slipstream as I do, but want to save a bit and have a lighter, rust prof bike you might consider the Linear Limo LWB USS recumbent. These two bikes have similar geometry and ergonomics. The Avatar 2000 developed at MIT in 1980 influenced both designs. Most riders who like the ride of one will like the ride of the other. I guess the only things I don’t like about the Longbikes are the mesh bottom seat and the bike’s weight. Longbikes, though not perfect, has clearly earned its excellent reputation for quality. If you are looking for a bombproof USS bike, take a Longbikes for a test ride. *Weight varies depending on the seat chosen. Linear offers several seat options.